“Alla Puttanesca” literally means “in the style of a whore” in Italian. The name famously refers to prostitutes, with stories (most of them debunked by historians) attributing the connection to the fact that the dish was quick to make between clients, or so aromatic it helped prostitutes attract them. However, it is an Italian sauce usually served over pasta that was invented in Naples. Its ingredients typically include tomatoes, olive oil, anchovies, olives, capers, and garlic. Various accounts exist as to when and how the dish originated, but it likely dates to the mid-twentieth century. The earliest known mention of it is in Raffaele La Capria’s, Ferito a Morte (Mortal Wound), a 1961 Italian novel which mentions “spaghetti alla puttanesca come li fanno a Siracusa” (spaghetti alla puttanesca as they make it in Syracuse). The sauce became popular in the 1960s, according to the Professional Union of Italian Pasta Makers. The 1971 edition of the Cucchiaio d’argento (The Silver Spoon), one of Italy’s most prominent cookbooks, has no recipe with this name, but two which are similar: The Neapolitan spaghetti alla partenopea, is made with anchovies and generous quantities of oregano; while spaghetti alla siciliana adds green peppers. Still again there is a Sicilian style dish popular around Palermo that includes olives, anchovies, and raisins. In a 2005 article from Il Golfo—a daily newspaper serving the Italian islands of Ischia and Procida—Annarita Cuomo wrote that sugo alla puttanesca was invented in the 1950s by Sandro Petti, co-owner of Rancio Fellone, a famous restaurant and nightspot. According to Cuomo, Petti’s moment of inspiration came when—near closing one evening—he found a group of customers sitting at one of his tables. He was low on ingredients and so told them he didn’t have enough to make them a meal. They complained that it was late and they were hungry. “Facci una puttanata qualsiasi,” or “throw together whatever,” they insisted. Petti had nothing more than four tomatoes, two olives and some capers—the basic ingredients for the sugo, “So I used them to make the sauce for the spaghetti,” Petti told Cuomo. Later, Petti included this dish on his menu as spaghetti alla puttanesca. The sauce alone is called sugo alla puttanesca in Italian. Recipes may differ according to preferences; for instance, the Neapolitan version is prepared without anchovies, unlike the version popular in Lazio, where spices are added with the anchovies. In most cases, however, the sugo is a little salty (from the capers, olives, and anchovies) and quite fragrant (from the garlic). Traditionally, the sauce is served with spaghetti, although it is also paired with penne, bucatini, linguine and vermicelli. Chopped garlic and anchovies are sautéed in olive oil. Chopped chili peppers, olives, capers, diced tomatoes and oregano are added along with salt and black pepper to taste. The sauce is reduced by simmering and is poured it over spaghetti and topped with chopped parsley. Whatever its Italian origins, Americans have made it a popular sauce. Besides pasta, the sauce can be served over fish, beans or meat. I like it served over pork chops. Here is my version. Sprinkle pork with salt and pepper. Heat the olive oil in a medium skillet over medium-high heat. Reduce heat to medium and add the pork. Cook, turning once until browned and an instant-read thermometer registers 140°F, about 8 minutes. Transfer to a plate and tent with foil to keep warm. Add the wine and cook for one minute. Add the garlic and anchovies (or anchovy paste) to the pan. Cook, stirring, for 30 seconds. Add tomatoes, olives, capers, and crushed red pepper; cook, stirring, for 1 minute. Add the tomatoes and simmer until the tomatoes break down and the sauce is thickened, 2 to 4 minutes. Return the pork and any juices to the pan, turning to coat with the sauce. Top the pork with the chopped oregano and parsley. Serve with cooked pasta. Bring a large pot of salted water to a boil. Cook the pasta al dente and drain. In the same pot add the butter and garlic and cook on low heat just until the butter melts. Add the pasta, cheese, and black pepper, toss and serve with the pork. Preheat the oven to 400 degrees F. Oil a baking dish. Place the broccoli in the prepared baking dish and drizzle with the olive oil, sprinkle with the lemon zest, salt, and pepper. Toss well and roast for 15 -20 minutes in the preheated oven until crisp-tender and the edges are starting to brown, tossing occasionally. This week my market had broccoli rabe and fennel on sale. It was Italian week and all things Italian were a great buy. Naturally, I took advantage of this sale. Used the broccoli rabe in this recipe, half the fennel bulb in the pork scaloppine recipe and I will use the remainder of the fennel in a salad. Cut the broccoli rabe into two-inch lengths. Bring a large pot of water to a boil. When the water comes to a boil, salt generously and add the broccoli rabe. After the water returns to a boil, boil two minutes. Using a deep-fry skimmer or slotted spoon, transfer the broccoli rabe to a colander. Do not drain the hot water in the pot, as you’ll use it to cook the pasta. Heat the oil over medium heat in a large, heavy nonstick skillet. Add the garlic and red pepper flakes, cook for a minute and stir in the broccoli rabe. Toss to coat in the oil. Season with salt and pepper and remove from the heat. Place the ricotta in a large pasta bowl. Bring the water in the large pot back to a boil and add the pasta. Cook al dente. Ladle 1/2 cup of the cooking water from the pasta into the ricotta and stir together. Drain the pasta, and toss with the ricotta, broccoli rabe and cheeses. Serve at once. Florida grown peppers were also on sale, so along with the fennel, I had the makings of a side dish. Trim the pork of all fat. Place the pork slices between two pieces of plastic wrap and pound thin. Combine the flour with the fennel, salt and pepper. Dredge the pork slices in the flour mixture, coating each slice well. Heat the oil in a skillet and add the pork. Cook until brown and turn the slices over. Once brown, add the wine to the skillet and move the slices around until they are coated in the wine. Remove the pork from the skillet and serve over the roasted vegetables. Pour any juices from the skillet over the pork. In a large bowl, combine fennel, peppers, onion and garlic. Sprinkle with Italian seasoning, salt and pepper. Drizzle oil over top and mix with a large spoon. Transfer vegetables to a shallow baking pan and bake 30 minutes, mixing once, until the vegetables are tender. Sprinkle with lemon juice and mix gently. I usually cook extra fish fillets so I can make fish cakes with the extra later in the week. It is one of our favorite dishes. Cook the fish if is raw. The fish can be baked, broiler or sautéed. It doesn’t matter for this recipe. Cool if cooking the fish just before making the cakes. Flake the fish in a mixing bowl and add all the remaining ingredients, except the Panko crumbs. Mix well. Divide the mixture into four equal balls. Place on the Panko crumbs, flatten the cakes and coat on all sides. Chill in the refrigerator for at least 30 minutes. Heat 2 tablespoons olive oil in a large skillet and brown the fish cakes on both sides. Drain on paper towels and serve with Tartar Sauce. I am sure you have heard of Chicken Cacciatore but how about Beef Cacciatore? I came up with this recipe when I had several beef round roasts in the freezer and did not want to make a traditional pot roast. This is a great dish to make at this time of year. Assemble it and put in the oven and then you can go on with your holiday preparations. Cook some pasta or mashed potatoes and you have dinner. A typical bottom round roast that weighs 3 to 4 pounds should be slow roasted in a Dutch Oven for about 4 hours for a tender roast with an internal temperature of 165 to 170 F(74 to 77 °C) . Preheat the oven to 300 °F (149 °C) and slow roast the meat for 3 to 4 hours, depending on the weight. Brown the roast on all sides in the oil in an ovenproof Dutch Oven. Season the roast with salt and pepper. Add the garlic, onions, bell peppers and mushrooms. Let them cook for a few minutes, stirring occasionally. Add the wine, tomatoes, seasoning and some additional salt and pepper. Bring to a boil. Cover the pan and place it in the oven. Cook for about four hours or until very tender. Turn the roast over several times during cooking. Remove the roast to a large plate and let rest for ten minutes. Slice thin. Cook the pasta in boiling salted water until al dente. Drain. Bring the sauce to a boil in the Dutch Oven and reduce the heat to low. Add the drained pasta and let heat for a minute or two. Pour into a large pasta serving bowl and place the sliced beef on top. Serve this meal with a green salad. Chianti, Italy, is the Classico wine region in the province of Tuscany, Italy. Chianti” is the name of the wine region but the wine from Chianti is known as Chianti Classico, to distinguish it from other Chianti wines that come from areas of Tuscany outside the Chianti region. Stretching between Florence and Siena, in the heart of Tuscany, the Chianti wine region is highly romanticized area with its terracotta-roofed towns and vineyards stretching across sun-draped hillsides. However, you no longer will find the straw-wrapped wine bottles readily available. Today, Chianti vintners produce excellent, nuanced wines that are worthy of elegant surroundings. The Chianti DOCG covers all the Chianti wine region and includes a large stretch of land encompassing the western areas of Pisa near the coast of the Tyrrhenian Sea, the Florentine hills to the north, the province of Arezzo in the east and the Siena hills to the south. These vineyards overlap the DOCG regions of Brunello di Montalcino, Vino Nobile di Montepulciano and Vernaccia di San Gimignano. Any Sangiovese-based wine made according to the Chianti guidelines from these vineyards can be labelled and marked under the Chianti DOCG should the producer wish to use the designation. The first definition of a wine-area called Chianti was made in 1716. In 1932 the Chianti area was completely re-drawn and divided in seven sub-areas: Classico, Colli Aretini, Colli Fiorentini, Colline Pisane, Colli Senesi, Montalbano and Rùfina. Wines labelled “Chianti Classico” come from the biggest sub-area of Chianti, that includes the original Chianti heartland. Only Chianti from this zone may boast the black rooster seal (known in Italian as a gallo nero) on the neck of the bottle, which indicates that the producer of the wine is a member of the Chianti Classico Consortium, the local association of producers. During the 1970s producers started to reduce the quantity of white grapes in Chianti. In 1995, it became legal to produce a Chianti made completely from Sangiovese grapes. For a wine to retain the name of Chianti, it must be produced with at least 80% Sangiovese. Aged Chianti (38 months instead of 4–7), may be labelled as Riserva. Chianti that meets more stringent requirements (lower yield, higher alcohol content and dry extract) may be labelled as Chianti Superiore, although Chianti from the “Classico” sub-area is not allowed to be labelled as “Superiore”. The facility includes a 129,000-square-foot, multilevel winery, with an energy-efficient gravity-flow system and naturally cool underground barrel rooms that have yet to need air-conditioning. In addition, the new location houses the company’s headquarters, an auditorium, boutique, restaurant, museum, olive oil mill and a facility for producing sweet Vin Santo. Its most dramatic features are the glass-walled tasting rooms that rise above the cathedral-like barrel cellars and the exterior onion-peel staircase that climbs to a terrace built on a swooping 70-foot roof overhang. This is never next to the classification and often indicates that the wine is a blend of grapes, as in the case of a Super Tuscan wine. Italian wineries will often use words like Tenuta, Azienda, Castello or Cascina in their name. What makes Chianti the perfect food wine? Chianti, a red blend from Tuscany, is as essential to Italian cuisine as extra virgin olive oil. When you think of pairing Chianti with food, most people think of pasta and it is a perfect combination, but there is so much more that you can pair with Chianti. It’s a great compliment to strong-tasting poultry dishes, spiced lamb or even beef (as long as it’s not overly fatty). If you are looking for a good wine with pizza, Chianti is a good choice. Chianti’s is a perfect accompaniment for lasagna. It’s higher acid level stands up well to Lasagna’s rich tomato sauce and it has enough flavor to stand up to sausage or meat that is often part of the dish. A rich meat sauce made with a tomato and wine base pairs with Chianti. The herbs used to flavor the meat pair perfectly with the slightly acidic nature of Chianti. It was first created in San Francisco by the fishermen whose diet was pretty much limited to whatever they caught at sea and didn’t sell. Trading with other fisherman for different types of seafood brought variety and, in the process, created one of the world’s favorite seafood stews. The brininess brought by the seafood along the tomato flavor are the ideal compliment for Chianti. Pair pizza with Chianti. Chianti is light enough to not overwhelm pizza Margherita’s simple flavors of basil, tomatoes and cheese. In a small saucepan, bring the beef broth to a boil. Soak porcini mushrooms in the boiled broth for 30 minutes. With a slotted spoon, remove the porcini, chop them and set them aside. Reserve the broth. Heat the oil in a large heavy bottomed saucepan over medium high heat. Add a layer of pork ribs and brown the meat on all sides, about 3 – 5 minutes per side. Remove the browned pork, set aside and repeat with the remaining pork until all the pieces are well browned. Pour off any remaining fat from the pan. Add the pancetta and cook until lightly browned, about 5 minutes. Add the cremini mushrooms and cook until they are softened and most of the released juices evaporate. Add the garlic, onions and carrots and cook until softened, about 6-8 minutes. Add the wine, meat, reserved porcini beef broth, chopped porcini mushrooms and tomatoes to the pot. Mix well and bring it to a brisk simmer. Cover and adjust heat to a low simmer for 1-1/2 hours. Stir frequently, add 1/4 cup of water as needed to keep it moist. Cook the pappardelle pasta al dente according to package directions. Drain. Mix the pasta with the ragu and top with the parsley. Over low heat in a small saucepan, heat the olive oil and the chopped rosemary leaves. Once the oil and rosemary start to sizzle, remove from the pan from the heat and cool to room temperature (can be done 4 days in advance). Whisk 1/4 cup of the rosemary oil with the white wine vinegar; add the chicken pieces and marinate for 30-60 minutes. Reserve the remaining oil. Remove the chicken pieces from the marinade and lightly season with salt and pepper. Wrap each piece of chicken with a piece of prosciutto. Alternate the chicken and sausage on the skewers, placing a sage leaf between them. Each skewer should have about 2 pieces of chicken and 2 pieces of sausage to make 12 skewers. Refrigerate the kebabs until ready to cook. When ready to grill, brush the chicken and sausage with some of the remaining rosemary oil. Heat a grill and create a low heat section. Cook the skewers over low heat and turn frequently to avoid burning, about 5 minutes on each side. Brush with more rosemary oil if the meat appears dry during cooking. Alternatively, the skewers can be cooked in the broiler until they are browned. 1 large cooked Dungeness crab (about 2 pounds), cracked and cleaned, still in the shell. In a large pot, melt the butter with the olive oil over low heat. Sauté the celery, onions and garlic until soft (about 5 minutes). Add all the other ingredients EXCEPT the seafood and simmer on low heat, uncovered, for one hour. Add a little water if the sauce becomes too thick. Adjust seasonings to taste. Add the white fish and shrimp. Simmer, covered, for about 5 minutes. Add mussels and simmer for 3-5 minutes more, until the shells open. Discard any mussels that do not open. Add the crab last and just heat through. Ladle the stew into large bowls and serve with crusty sourdough bread and lots of napkins. Mix together the first 6 ingredients in a bowl. Stir in 2 tablespoons of the oil. Season with salt and freshly ground black pepper. Place the filling over the flank steak covering it evenly. Starting at the shorter end, roll up the flank steak into a tight cylinder. Tie the roll with butcher’s twine (kitchen string). Heat a large ovenproof skillet or Dutch oven over medium high heat. Add the remaining 2 tablespoons of oil and the braciole. Brown the meat on all sides, about 10 minutes total. Carefully remove the braciole to a plate. Add the onion to the pan and cook until tender, about 5 minutes. Add the wine and bring to a boil, scraping the bottom of the pot. Add the tomatoes. Bring to a boil and then reduce heat to medium low. Allow to simmer for a few minutes to incorporate all the ingredients. Season with salt and freshly ground black pepper. Put the braciole back into the pan. Cover with a lid or foil and place in the oven. Bake turning the braciole every 30 minutes and basting with the tomato sauce. After one hour uncover the pan and bake until the meat is tender, about 1 1/2 to 2 hours. Add more wine or water to the sauce if needed as it cooks. Remove the braciole from the sauce and let rest for ten minutes. Remove the twine. Slice the braciole into 1 inch thick slices. Transfer to a warmed platter. Spoon the sauce over. Sprinkle with the basil and parsley. Italy is surrounded by the sea where there is an abundance of fresh fish. Seafood is a very important part of the Italian cuisine and fresh seafood is the key to the best tasting Italian meals. Regional recipes for salt-water fish—and sometimes for fresh-water fish from Italy’s many lakes, rivers, and streams—are some of the most celebrated dishes in Italian cuisine. One of the reasons that the Mediterranean people and their diet is so healthy is that they eat a lot more fish than they eat meat. Fish such as tuna, herring, salmon and sardines are rich in omega-3 fatty acids and shellfish including mussels, oysters, and clams have similar benefits for the brain and heart health. Adding Italian flavors to your fish, makes dinner so much more interesting. Try these out next time you are cooking fish. Remove the tails from the shrimp, if present. Combine the shrimp, tomatoes, parsley and marinara sauce in a saucepan and heat just until warm. Cut the loaf of bread in half lengthwise and then crosswise, so you have four pieces. Place the bread on a baking sheet. Broil 4 to 5 inches from the heat for about 2 minutes or until light, golden brown. Spread the ricotta on the toasted bread and top with the warmed shrimp mixture. Sprinkle with hot pepper flakes and parsley before serving. In a blender container combine the salad dressing and half the roasted red sweet peppers; process until nearly smooth. Chop the remaining peppers. In a mixing bowl combine the chopped peppers with the tuna, corn and 1/4 cup of the roasted red pepper sauce. For each club sandwich: spread two slices of toasted bread with tuna filling, layer with lettuce leaves, stack the two slices, then top with a third slice of toast. Cut in half diagonally. Serve with remaining roasted red pepper sauce as a dipping sauce. Combine all the ingredients in a jar or mixing bowl and whisk until completely smooth. Use immediately or store in a jar in the refrigerator up to 5 days. In a screw-top jar, combine vinegar, oil, oregano, mustard, the 1/8 teaspoon salt and a dash black pepper. Cover and shake well. Set aside 1 tablespoon of the dressing in a small container with a cover and chill until serving time. In a large bowl, combine the fennel strips and carrot. Pour the remaining dressing over the fennel mixture. Toss lightly to coat. Cover and chill for 2 to 24 hours. Pat the fish dry with paper towels. In a small bowl, stir together the crushed fennel seeds, the 1/2 teaspoon salt and the 1/4 teaspoon pepper; sprinkle evenly over both sides of the fish. Heat a stove top grill ( or use the broiler). Grill for 4 to 6 minutes per 1/2-inch thickness of fish or until the fish flakes easily when tested with a fork. Carefully turn fish once halfway through grilling. Drizzle the reserved 1 tablespoon dressing over the grilled fish. Cut the fish into four pieces and serve with the fennel salad. Garnish with fennel tops. Bring a large pot of salted water to boiling. Trim zucchini. Trim and peel carrot. Using a vegetable peeler, cut the zucchini and carrot lengthwise into thin ribbons. Set aside. Cook pappardelle pasta al dente according to the package directions and add the broccoli during the last 4 minutes of cooking time. Reserve 1/2 cup of the cooking water and drain the pasta and broccoli. In a large skillet, heat oil and cook the fillets about three minutes on each side. Place on a plate and cover with foil to keep warm. In the same skillet, combine the wine, broth, Italian seasoning, the salt and the crushed red pepper. Bring to boiling; reduce heat. Simmer, uncovered, about 4 minutes or until the liquid is reduced by half. Add the reserved 1/2 cup pasta cooking water. Bring back to boiling. Add drained pasta, broccoli and vegetable ribbons to the skillet. Gently cook and stir until the pasta is coated with the sauce mixture and thickens slightly. Stir in the cherry tomatoes, the 1/2 cup Parmesan cheese and half of the parsley. Heat until the cheese is incorporated and the tomatoes are slightly softened. Divide pasta, vegetables and sauce into four individual pasta bowls. Break fish into large chunks and place on top of each pasta serving. Sprinkle with the remaining parsley. Pat fish dry with paper towels. Set aside. In a small saucepan cook the green onions and garlic in 2 tablespoons of oil for 1 to 2 minutes or until the onions soften. Remove the saucepan from the heat. Crumble saffron threads into the mixture; stir. Let stand to infuse the saffron. Cut a thin slice from one end of each orange or grapefruit and the lemon, so the fruit will sit level. Working on a cutting board, cut down from the top of the fruit to remove the peel and white part of the rind. Working over a bowl to catch the juices, remove the fruit sections by cutting into the center of the fruit between one section and the membrane; cut along the other side of each section next to the membrane to free the section. Remove seeds. Add saffron mixture to the bowl with the fruit sections and juices. Stir in the mint, 1/4 teaspoon of the salt and 1/4 teaspoon of the pepper. Lightly brush both sides of the swordfish steaks with the remaining olive oil; sprinkle with the remaining 1/4 teaspoon salt and the remaining 1/4 teaspoon pepper. Grill fish on the rack of a covered grill directly over medium heat for 8 to 12 minutes or just until fish flakes when tested with a fork, turning once halfway through cooking time. Or use a stove top grill or a broiler. Add some asparagus spears to the grill with the fish. Turn the asparagus several times during the grilling time. Gently stir fruit-mint mixture to combine and spoon over the fish. Serve the asparagus on the side. With the weather getting cooler in many parts of the country, we may find ourselves entertaining friends for dinner rather than hosting casual, warm weather BBQs. There are so many good choices in the fall for your menu that it is difficult to know where to begin. Chicken is always a good choice but for a dinner party, the chicken recipe should be something a little different; something your guests may not have had before – just to keep things interesting. Choose vegetables in season, a side of potatoes, noodles or rice and a great appetizer. Please find below one of my fall dinner party menu suggestions and the recipes to go with it. Preheat oven to 400 degrees F. and line two baking sheets with parchment. On a lightly floured surface, roll out one of the dough balls to a 15 x 10 inch rectangle. Brush the dough lightly with olive oil. Use half the meat, cheese and peppers, and cover the dough, leaving a 1/2 inch border. Roll the dough up into a log and brush the seam edges with beaten egg. Leaving the seam at the bottom and pinching the ends closed, place the roll on one of the baking sheets. Complete the other roll in the same manner. Brush the rolls with the beaten egg mixture and bake for about 20 minutes or until golden brown. Preheat the oven to 425°F and position a rack in the upper third. Coat the chicken in flour and season generously with salt and pepper. In a Dutch Oven or large ovenproof skillet heat half of the butter and half of the oil. Add half the chicken, skin side up, and cook over high heat until browned, about 5 minutes. Turn and cook the chicken for 1 minute. Remove to a large platter. Repeat with the remaining butter, oil and chicken. When brown place on the platter with the first batch of chicken. Add the scallions and garlic to the skillet and cook until the onions begin to soften, about 2 minutes. Add the broth and vinegar and bring to a boil. Season with salt and pepper. Place the chicken on top, skin side up and roast for about 25 minutes, until it is cooked through. Bring a large pot of salted water to a boil. Add the pappardelle and cook until the al dente stage. Drain. Place the noodles on a large serving platter. Place the Dutch Oven on top of the the stove and transfer the chicken with a slotted spoon to the platter with the noodles, arranging the chicken attractively over the noodles. Bring the mixture in the pot to a boil over high heat and cook until the liquid is reduced by half, about 5 minutes. Add a little of the sauce to the sour cream, mix well and whisk the sour cream into the mixture in the pot. Simmer until the sauce is hot and slightly thickened, about 2 minutes. Do not boil or the sour cream will curdle. Season with salt and pepper. Pour the sauce over the chicken and serve. Look for broccoli rabe with vibrant green leaves and plump stems. Heat the oil and garlic in a large straight-sided skillet over medium heat, stirring frequently, until garlic is sizzling and aromatic, but not browned, about 2 minutes. Add the broccoli rabe, zest and 3/4 teaspoon salt, then use tongs to toss and coat in oil. Add the stock and bring to a boil, then reduce heat to a simmer. Cover and cook until broccoli rabe is tender, 7 to 10 minutes. Transfer contents of pan (including liquid) to a serving bowl. Grind pepper over top and drizzle with olive oil and lemon juice. Position a rack in the center of the oven and preheat to 350 degrees F. Line two large baking sheets with parchment paper. Reserve one baking sheet for later when you bake the biscotti slices. Place pistachios in a single layer on a third baking sheet and toast the nuts in the oven for 8 to 10 minutes, or until just golden. Remove the nuts from the pan and set aside to cool. In a large bowl, mix toasted pistachios, cherries, sugars, baking powder and flour. In a small bowl, whisk eggs and vanilla extract until well blended. Add to the flour mixture. Stir a few times. Work the batter together with lightly floured hands. The mixture will be sticky, but persevere. Keep squeezing the batter with your hands, until a dough starts to form. Once the dough is firm, form a ball. Divide the ball into 2 equal pieces. On a lightly floured surface, place one piece of dough and, using your hands, roll into a log shape that is approximately 8 inches long and 2 inches wide. If it’s sticky, simply dust your palms with more flour. Repeat with the remaining piece of dough. Place the two logs on one baking sheet. Brush the loaves all over with 1 lightly beaten egg. Bake for 40 minutes, turning the pan around halfway through, or until the tops of the loaves are shiny and deep golden. Cool on a rack for about 20 minutes before slicing. Place a loaf on a cutting board. Using a large serrated knife, cut 1/2-inch-thick slices, either straight or on the diagonal. Use a sawing motion to prevent crumbling. If the cookie is crumbling, then let it cool a few more minutes. Don’t let it rest too long, however, or it could become too hard to slice. Place slices on their sides on the baking sheets. Reduce the oven temperature to 200 degrees F and bake the biscotti for 20 minutes, until toasted and crisp. Turn the biscotti slices over and rotate the pans after ten minutes. Remove the pans from the oven and cool the biscotti completely before storing in an airtight container. Position the rack in the center of the oven and preheat to 350 degrees F. Line two large baking sheets with parchment paper. Reserve one baking sheet for later when you bake the biscotti slices. Place hazelnuts in a single layer on a third baking sheet and toast the nuts in the oven for 8 to 10 minutes, or until just golden. Remove the nuts from the pan and set aside to cool. Chop the nuts into large pieces. In a large bowl, mix toasted hazelnuts, chocolate chips, sugars, baking powder, cocoa, flour, cinnamon and espresso powder. In a small bowl, whisk eggs and coffee liqueur. Add to the flour mixture. Stir a few times. On a lightly floured surface, place one piece of dough and, using your hands, roll into a log shape that is approximately 8 inches long and 2 inches wide. If it’s sticky, simply dust your palms with more flour. Repeat with the remaining piece of dough. Place the two logs on one baking sheet. Brush loaves all over with 1 lightly beaten egg. Benvenuto Cellini was a Florentine sculptor, goldsmith, soldier and writer. He was born in 1500 in Florence, Italy and his parents were Giovanni Cellini and Maria Lisabetta Granacci. They were married for eighteen years before the birth of their first child. Benvenuto was the second child of the family. The son of a musician and builder of musical instruments, Cellini was pushed towards music,but when he was fifteen his father reluctantly agreed to apprentice him to the goldsmith, Antonio di Sandro. However, at the age of sixteen, Benvenuto attracted attention in Florence by taking part in an altercation with his companions. He was banished for six months by the magistrates and went to live in Siena, where he worked for a goldsmith named Fracastoro. From Siena he moved to Bologna, where he became a more accomplished flute player and made progress as a goldsmith. After a visit to Pisa and a period of studying sculpture in Florence, he moved to Rome. His first artistic works were a silver casket, silver candlesticks and a vase for the bishop of Salamanca, which won him the approval of Pope Clement VII. Another celebrated work from his time in Rome is the gold medallion, “Leda and the Swan”, created for Gonfaloniere Gabbriello Cesarino that is now in the Museo Nazionale del Bargello in Florence. He also took up the flute again and was appointed one of the pope’s court musicians. In the attack on Rome by Charles III, Duke of Bourbon, Cellini gained fame as a soldier. According to his own accounts, he shot and injured Philibert of Châlon, Prince of Orange. His bravery led to a reconciliation with the Florentine magistrates and he soon returned to his hometown of Florence. Here, he devoted himself to crafting medals in gold, the most famous of which are “Hercules and the Nemean Lion” and “Atlas Supporting the Sphere”, the latter eventually falling into the possession of Francis I of France. He returned to Rome and this time he was employed in the craft of making jewelery and in casting dies for medals and the papal mint. In 1529 his brother, Cecchino, killed a Corporal of the Roman Watch and, in turn, was wounded. He later died. Soon afterward Benvenuto killed his brother’s killer – an act of blood revenge, but not justice, as Cellini admits that his brother’s killer had acted in self-defense. Cellini fled to Naples to escape the consequences. Through the influence of several cardinals, he later obtained a pardon. 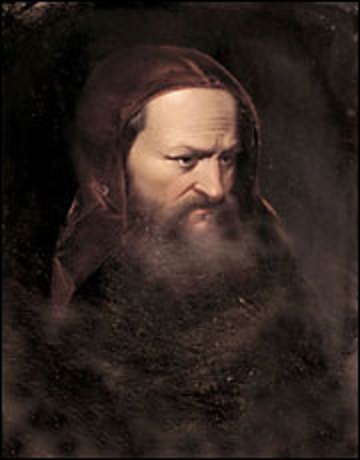 Cellini next went to Venice, where he was restored with greater honor than before. At the age of 37, after returning from a visit to the French court, he was imprisoned on a charge (apparently false) of having embezzled the gems of the pope’s tiara during the war. He was confined to the Castel Sant’Angelo, escaped, was recaptured and treated severely. The intercession Cardinal d’Este of Ferrara, eventually secured Cellini’s release, in gratitude for which he crafted d’Este a gold cup. Besides his works in gold and silver, Cellini created sculptures of a grander scale. One of the main projects of his French period is probably the “Golden Gate” for the Château de Fontainebleau. Only the bronze tympanum of this unfinished work, which represents the Nymph of Fontainebleau (Paris, Louvre), still exists, but the complete spectrum of his work can be known through archives,his preparatory drawings and reproduced casts. His most distinguished sculpture, the bronze group of “Perseus with the Head of Medusa” now in the Loggia dei Lanzi at Florence, was his attempt to surpass Michelangelo’s, “David” and Donatello’s, “Judith and Holofernes”. The casting of this work caused Cellini much trouble and anxiety, but it was called a masterpiece as soon as it was completed. By 1996, centuries of environmental pollution exposure had damaged the statue. In December 1996 it was removed from the Loggia and transferred to the Uffizi for cleaning and restoration. It was a slow, years-long process and the restored statue was returned to its home in June 2000. The autobiography of Benvenuto Cellini was started when he was 58 and ended just before his last trip to Pisa around the year 1563, when Cellini was approximately 63 years old. The memoirs give a detailed account of his career, as well as his loves, hatreds, passions and enjoyments, that is written in an energetic, direct and racy style. They show a great self-regard and self-assertion, sometimes running into extravagances which are impossible to credit. Despite its exaggerations and its often boastful tone, it is a document of surprising frankness and incomparable authenticity and, thanks to it Cellini’s character, is more intimately known than that of any other figure of his time. He died in Florence in 1571 at the age of 71 leaving behind a magnificent legacy of work. 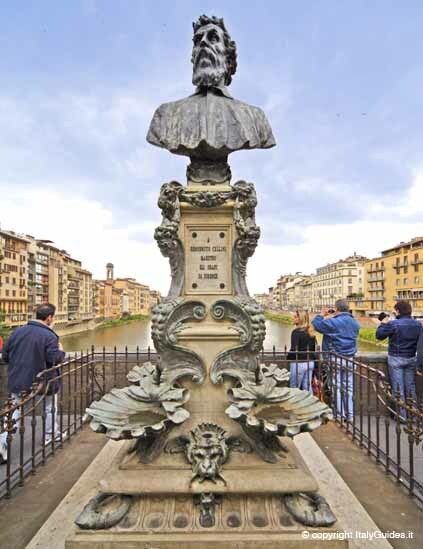 For all his exploits, Benvenuto Cellini remains a hero of Florence, in the Piazzale Degli Uffizi, outside the famous Uffizi Gallery, a life-size sculptor of him stands alongside the great masters of renaissance art, Da Vinci, Raphael and, of course, Michelangelo. Still in the news today, Cellini’s gold and enamel masterpiece the “Saltcellar of Francis I” executed in 1540 for the King of France and valued today at $60,000,000, was recovered recently after being stolen from a museum in Vienna. Being chosen as a member of the Accademia delle Arti del Disegno shows the respect he commanded: not just as an artist but as a patron of Florence. Much of the simplicity of Tuscan cuisine was born out of necessity. Wild herbs and greens were used in simple soups. Every part of the animal was used–cibreo is a popular Florentine chicken stew that features cockscombs. Tuscan bread, a rustic sourdough baked in a wood-fired oven, traditionally was made without expensive salt. 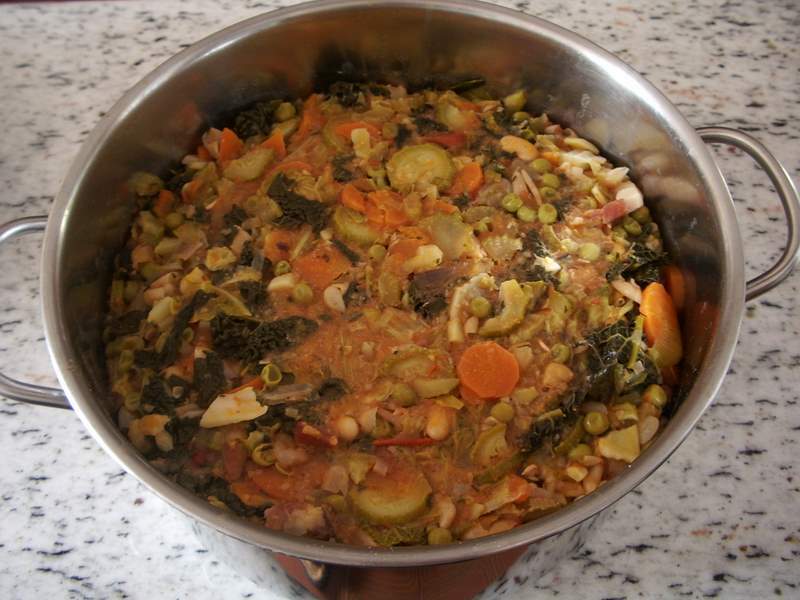 That meant it quickly went stale and so ribollita was born, a vegetable soup thickened with bread. Panzanella is a summer salad made from stale bread cubes, fresh tomatoes, basil and Tuscany’s famed olive oil. Wheat flour was another expensive ingredient and so Tuscans created dishes like castagnaccio, a cake made with chestnut flour, raisins, pine nuts, orange zest and olive oil. Dishes here have hearty, rustic flavors, well-matched to the area’s famous wines, and Florentines enjoy eating their regional cuisine in friendly, warm, informal settings. Typically, Florentine people never start a meal from the main course but always have a starter first. Whether eating in a restaurant or at home with friends, you will always find liver crostini (thin sliced toasted bread with liver patè) on the table. Alongside liver crostini the usual antipasto also offers different types of sliced salamis and hams. 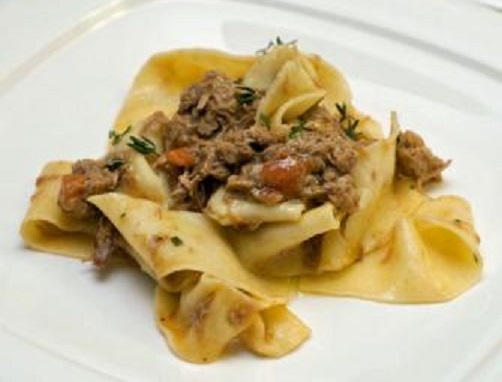 Pappardelle (similar to spaghetti, but a thicker pasta made with egg) with boar or hare sauce. It can be seasoned with other classic ingredients: porcini mushrooms, meat sauces, artichokes and sausages, etc. Other first course dishes are the soups: pappa al pomodoro, ribollita, carabaccia and black cabbage. These are all variations of a single base made from vegetables, bread and tomato. The hills around Florence abound with game, including wild boar which is used in locally made salamis and air-dried hams. Duck and rabbit appear on the table grilled. Fish from the region’s lakes and seafood from the coastal areas appear on the table. Porcini, wild mushrooms, are another favorite served in the fall after foragers have combed the woods around the city. Bistecca alla fiorentina (a T-bone steak) is served rare with a drizzle of Tuscan olive oil and often accompanied by white beans, roasted potatoes or a green salad. Porchetta is a suckling pig, stuffed with garlic and herbs and brushed with a rosemary branch while its roasts. Trippa alla fiorentina, tripe cooked with wine, tomatoes and herbs, is another signature dish. Florentine desserts: cantucci (small almond biscuits) to eat at the end of a meal dipped in Vinsanto or in the colder seasons the castagnaccio, that takes its name from the nearby mountains , is a thin cake made of chestnut flour and pine nuts. 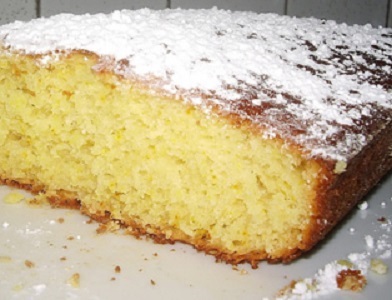 During Carnival or after the Epiphany, you can find schiacciata alla fiorentina, a soft sweet, sponge cake which can be filled with cream or chocolate and covered with powdered sugar. Sometimes Florentines like eating a sandwich in the street for lunch. 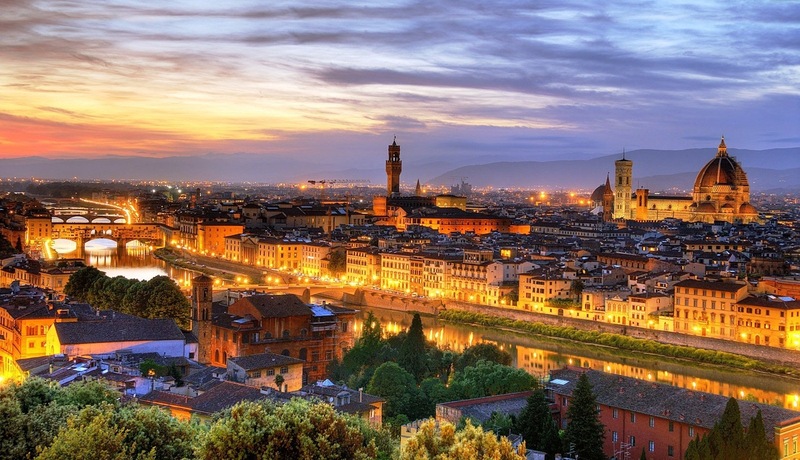 In addition to steak, Florence offers other meat specialties such as tripe and lampredotto. These are foods that are eaten in kiosks on the street, even in winter.They can be seasoned with green sauce and enriched with other vegetables, such as leeks. Heat the olive oil in a large skillet over low heat. Add the onions, capers and garlic and sauté just until fragrant, about 1 minute. Add the thyme, Marsala, anchovies and chicken livers. Season with salt, pepper and chili and cook until the chicken livers are just cooked through, about 5 minutes. Remove from the heat and discard the thyme. Transfer the contents of the skillet to a food processor. Add the butter and purée until smooth. 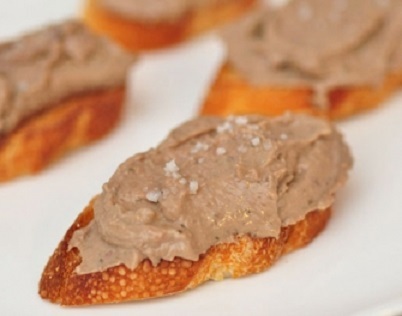 To serve, spread the chicken liver on toasted baguette slices and garnish with sea salt, if desired. Many Florentine recipes make use of leftover ingredients. 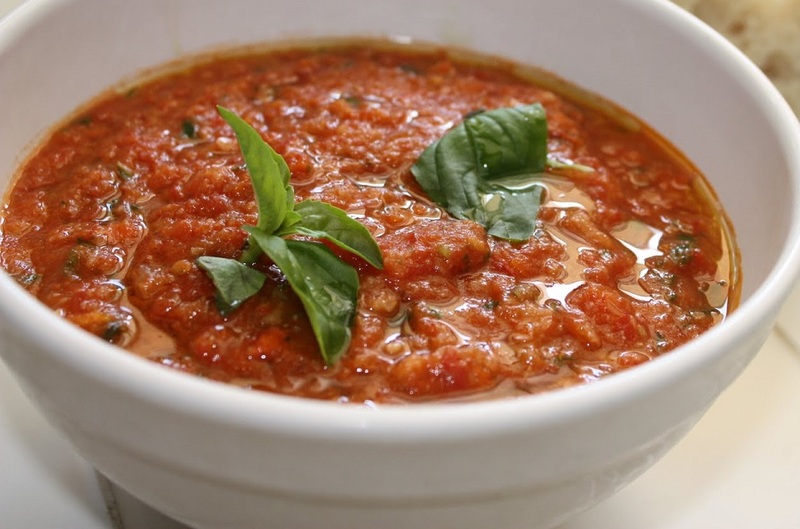 Pappa al Pomodoro, a thick, hearty soup made with dry bread, is one of the city’s classic dishes. Place the bread in a bowl and add water or broth. Cover and put aside for at least an hour. Sauté the garlic and leek in oil. Add dried chili pepper, the tomatoes, half the basil and a dash of salt and pepper. Simmer for 20 minutes. Squeeze excess broth from the soaked bread and add to the oil and tomatoes. Cook for at least 15 minutes, stirring occasionally. Serve hot with remaining basil and a swirl of olive oil. Ribollita means “reboiled,” because to make this rich, thick vegetable soup correctly, it must be cooked and recooked. Ribollita appears with many variations, but the key ingredient is cavolo nero ( winter black cabbage), though kale, chard, or green and Savoy cabbage can also be used. Add zucchini, potatoes, Brussels sprouts and other vegetables according to taste. Sauté the onion, leek, and garlic in a Dutch Oven in 1 tablespoon olive oil. Add carrots, celery, chili pepper and cook for ten minutes. Add tomatoes, cabbage, beans, herbs and salt and pepper to taste. Cook for 10 to 20 minutes. Chill the soup overnight. The next day purée half the mixture, return to the pot. Bring to a boil and reheat. Ladling the soup over a thick slice of toasted dry bread and add a swirl of olive oil to each serving. Rub the meat with the orange zest, lemon zest, rosemary and bay leaf. Cover and refrigerate overnight. Remove the duck breast from the herbs and dice the meat. Heat olive oil in a large saucepan over medium heat. Sauté the onion, carrot and celery until soft, about 5 to 10 minutes. Add the garlic and cook for 30 seconds. Add the diced duck meat. Cook until the meat has changed color, about 5 to 7 minutes. Add the red wine; cook until the alcohol has reduced and evaporated, about 2 minutes. Add the tomatoes and chicken stock. Simmer for 45-60 minutes, until the sauce is rich and thick. Bring a large pot of water to a boil. Cook the pasta until al dente. Drain pasta and mix with the sauce to serve. 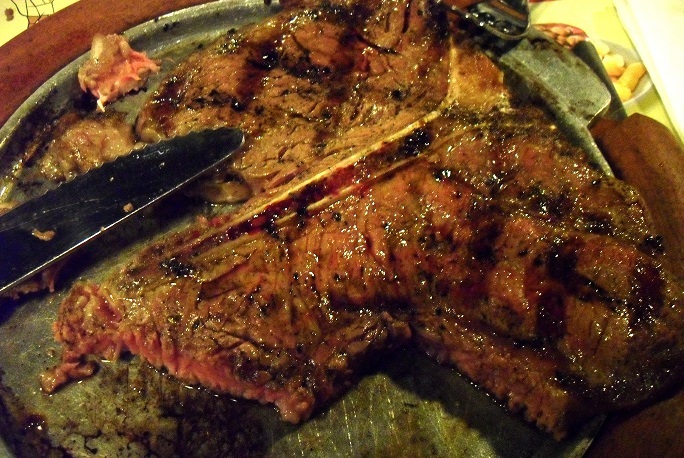 Traditionally, a T-bone from local Chianina beef cattle is preferred, but an ordinary T-bone (or porterhouse) can also be used. Florentines grill the meat over a very hot wood or coal, but it can also be cooked on a hot skillet or griddle. Grill the steak, without seasoning, for three to five minutes. Florentines often grill the steak standing up on the bone for a few minutes at the end to cook around the T-bone. The meat should be seared and crispy on the outside and red, almost raw at its heart. Allow to rest for ten minutes then cut the meat off the bone into large chunks. Season with coarse sea salt and serve. Preheat the oven to 360 degrees F. Spray a 9 by 13-inch baking pan with cooking spray. Mix flour, sugar, baking powder and orange zest in a mixing bowl. In another bowl mix orange juice, eggs, milk and oil and pour into bowl with flour. Beat with a hand mixer until thoroughly mixed together, about 3 to 4 minutes. Pour the batter to the greased pan and bake for about 25 minutes. Test the cake with a toothpick inserted into the center. If it comes out clean, the cake is done. Let cool for about 30 minutes on the counter, then turn the cake out of the baking pan. Slice and serve sprinkled with powdered sugar.